I pulled into the Bacara and happily announced to the valet that I was there for a massage. “Enjoy!” he replied, and that’s exactly what I planned to do, thanks to an invitation from Natura Bissē to experience its supposedly “infamous” Bubble Pure Air, a bright-white tent filled, for purported health benefits, with “99.995% percent pure” oxygen. It was welcome week for the Barcelona-based cosmetics company, which the Goleta resort recently enlisted for its spa services. “Do you want me on my stomach or back?” I asked, sliding under the covers. “Oh, this is a facial,” replied Ashley. “Whatever makes you comfortable,” she responded, with complete poise. And that’s how I fell into my first facial, a procedure I’ve paid for frequently for the women in my life to endure but have avoided personally because, it appears, I’m an ignorant male. For the next hour, Ashley, who explained that the oxygen-rich environment allows her products to better seep into my pores, lavished my mug with creams, cleansers, exfoliators, scrubs, and all of the other epidermal magics that are involved in an esthetician’s palette. “This is nourishing and calming,” she explained of one treatment, noting that others were “hydrating and relaxing,” “firming and toning,” and so forth. But the words didn’t matter — as her fingers fluttered over my cheeks and forehead, I realized that the face is probably our body’s most frequently flexed set of muscles and yet one that, at least for most men, we don’t give much focused care. Facials feel quite good, I quickly learned, and they even include a bit of head and shoulder massage. As I started to slip toward sleep — my longtime indicator of a good massage — Ashley piped up again. “Is it tingling?” she asked, as a papaya-laced exfoliator sizzled my skin. 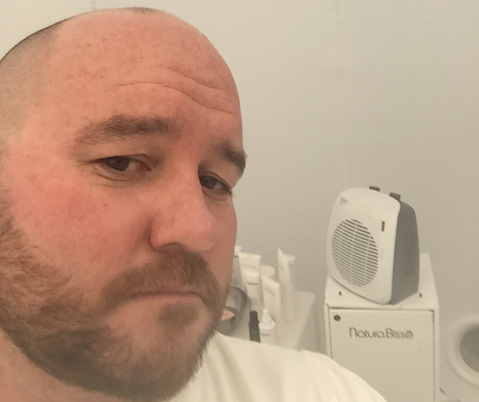 I groggily replied in the affirmative, happy to have that be the afternoon’s peak of intensity, instead of the squeezing and picking that I had mistakenly assumed were part of facials. (That is so yesteryear, I’ve since heard.) Soon, all was rinsed off, and Ashley — who, it turns out, was a supermodel in her prior career — left the tent while I re-robed. 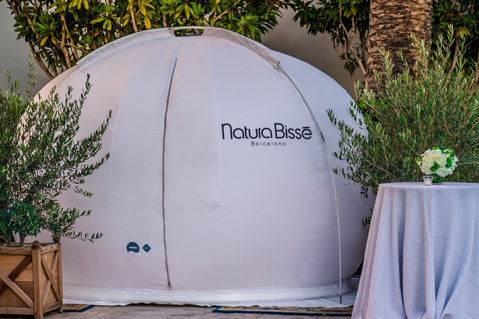 Natura Bissē facials are available year-round at the Bacara Resort & Spa ($185-$350), and the Bubble Pure Air pop-up is expected to return in 2017. See bacararesort.com.